Cardoon, originally uploaded by trekr. 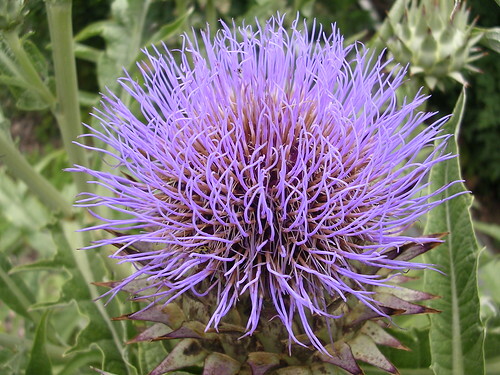 The first Cardoon bloom arrives just as the Clematis go to seed. Apparently, the plant is edible and reportedly has the look of celery and the taste of artichoke (they are in the same family of plants). Here is a recipe if you are inclined. I may try this next Spring!. Before you handle the plant, be aware it has nearly invisible stalks on the spines that can cause substantial pain.Â This is my third post featuring a weed.Â Weeds are everywhere. I never have to plant them.Â They require little care.Â They can surprise you.Â I’ve learned to enjoy weeds. This entry was posted on Saturday, May 26th, 2007 at 6:03 pm	and is filed under Garden. You can follow any responses to this entry through the RSS 2.0 feed. You can leave a response, or trackback from your own site.